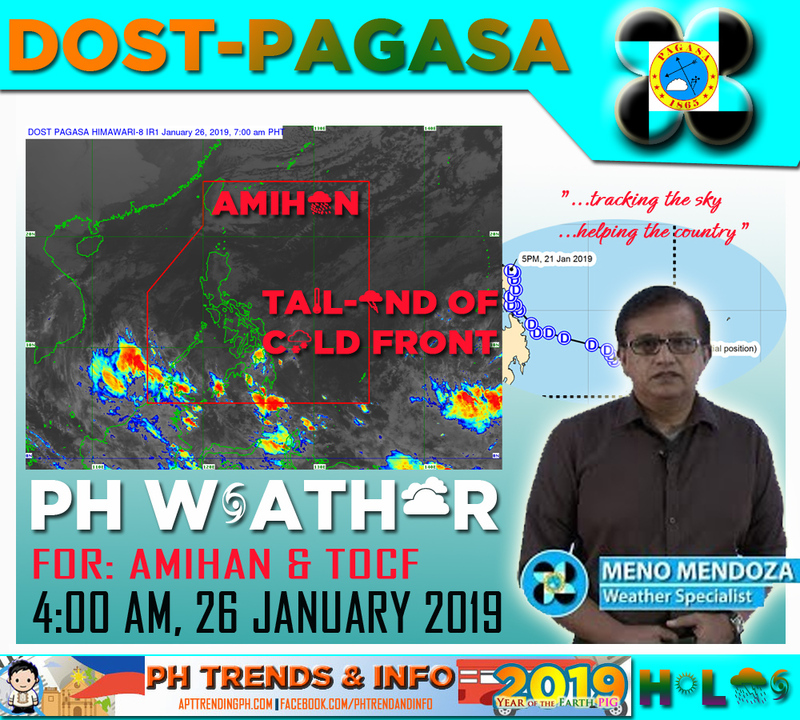 Home PAGASA DOST-PAGASA: Forecast Weather Condition for Tail-end of Cold Front and Amihan as of 4:00 AM 26 January 2019. DOST-PAGASA: Forecast Weather Condition for Tail-end of Cold Front and Amihan as of 4:00 AM 26 January 2019. Issued at: 4:00 AM 26 January 2019 with Meno Mendoza (Weather Specialist). Synopsis: Tail-End of a Cold Front affecting Eastern Visayas and Northern Mindanao. Northeast Monsoon affecting Luzon and rest of Visayas. Caraga, Northern Mindanao, Davao Region and Leyte Provinces will experience Cloudy skies with scattered rainshowers and thunderstorms due to Tail-End of a Cold Front. Possible flash floods and landslides due to scattered light to moderate with at times heavy rains. Cagayan Valley Region, Cordillera Administrative Region, Aurora, Quezon, Bicol Region and rest of Eastern Visayas will experience Cloudy skies with light rains due to Northeast Monsoon. No significant impact. Metro Manila and the rest of Luzon and of Visayas will experience Partly cloudy to cloudy skies with isolated light rains due to Northeast Monsoon. No significant impact. Rest of MIndanao will experience Partly cloudy to cloudy skies with isolated rainshowers due to Localized Thunderstorms. Possible flash floods during severe thunderstorms. Weather information is courtesy of DOST-PAGASA. World Welterweight Championship: Pacquiao vs. Broner Stats and Result.